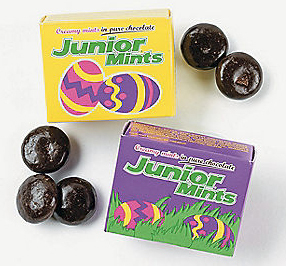 Junior Mints in Easter Camo! Look what has popped up in stores for Easter! Pretty Junior Mints in happy Easter pastels. 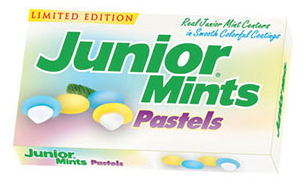 The Agnostic box is just called Junior Mint Pastels. My friend Rebecca found a box of the Easter ones at the Dollar store, and they taste just like the regular version, which is odd, since they aren’t chocolate brown…they do look lovely in a candy bowl, and I bet they would be great on cupcakes. If your looking for a great deal on mini boxes for Easter baskets, checkout Oriental Trading Company. The boxes are Easter colors, but the insides are regular, still, it’s a good price at $1.99 for a bag of 16 boxes. No matter if you buy the Easter, or the secular version, they taste great frozen! Posted in Dark Chocolate, Easter, Minty. Bookmark the permalink. …the agnostic box…the secular version…very very very funny…i am still laughing.